1 – What is it? Attendance is primaERP’s module designed to register the workers’ time in and out, as well as their breaks and engagement in their designated tasks. It works as an online punch clock with some of the perks of a time tracking application. Very simple: as in an old-fashioned mechanical punch clock, punch-in with the green button when you arrive, punch-out with the red button when you leave. For pauses or any specific tasks, use the buttons below those. For example, you arrive at work and clock in. At a certain point, you decide to have a coffee so you click on the corresponding button. Once you are done with your coffee, just click again on the green “Clock in” button and carry on with your duties. 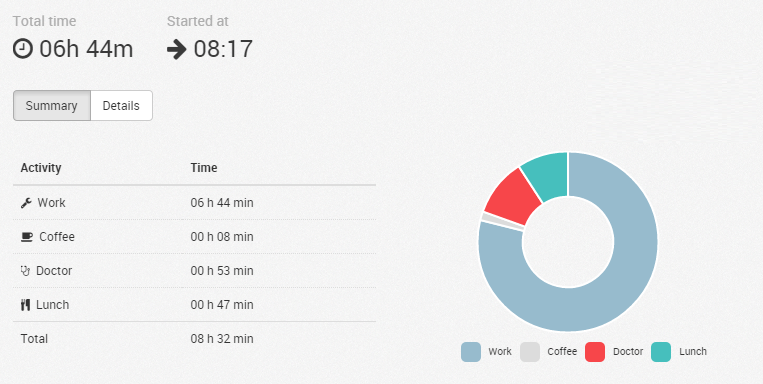 To follow up on how you have spent your day, check your day’s overview on the right side of the dashboard (see screenshot below) or in the timesheet (via the top bar), which you can print and e-mail to your manager. It is automatically filled with your data so you don’t have to. 3 – Can I edit a time record? You can both manually create or edit time records if you have been assigned a role that allows it. There are three kinds of user in Attendance: user, advanced user and administrator. As an advanced user or an administrator, you can create and edit time records freely. As just a “user”, you need to use the clock-in/clock-out function to create time records and will not be able to edit them afterwards. Ps: If you have any further questions about the setting up of attendance, check out our FAQ.